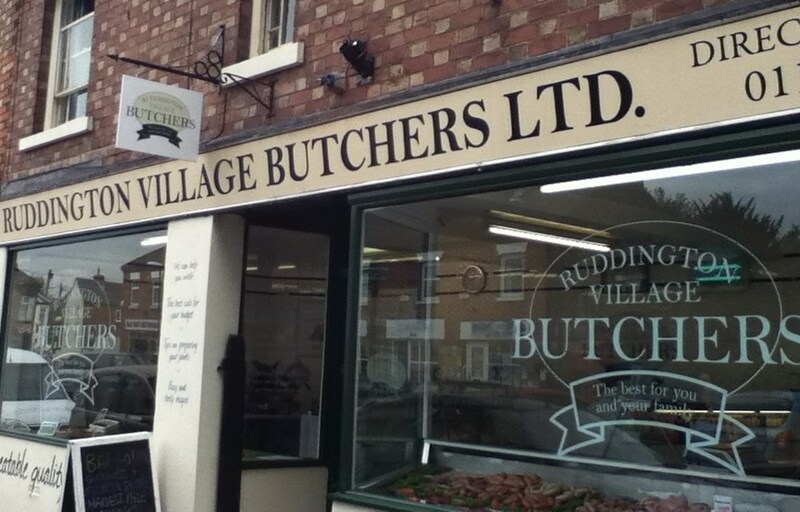 Ruddington Village Butchers is located just across from the bus stop facing the church at 15 Church Street in Ruddington. Run by local butcher Stewart White they note on their website that they ‘sell only locally-sourced meat’. 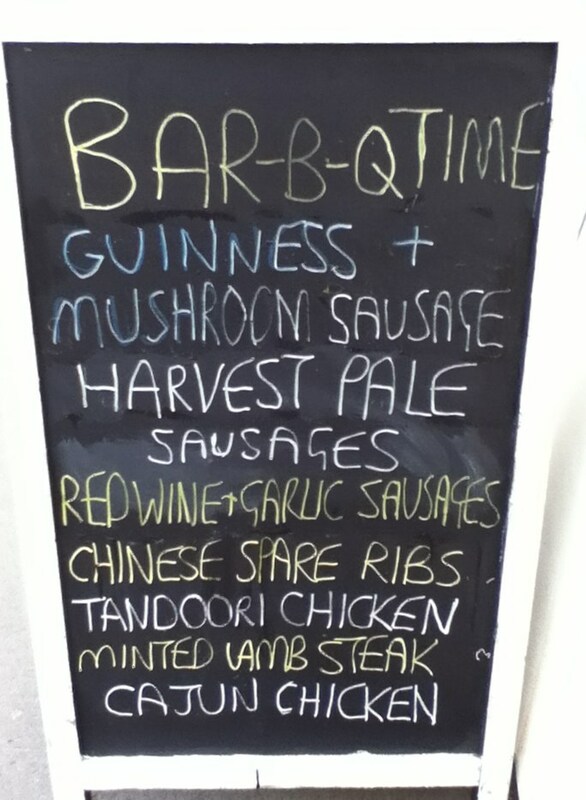 I have walked past and looked into the window a few times over the last month and my eye had been drawn to a sign that said “Harvest Pale Sausage” (one of my favourite local beers). Back then at the time my fridge and freezer had been full of farm shop and farmers market meat and so I had no room to add any more. 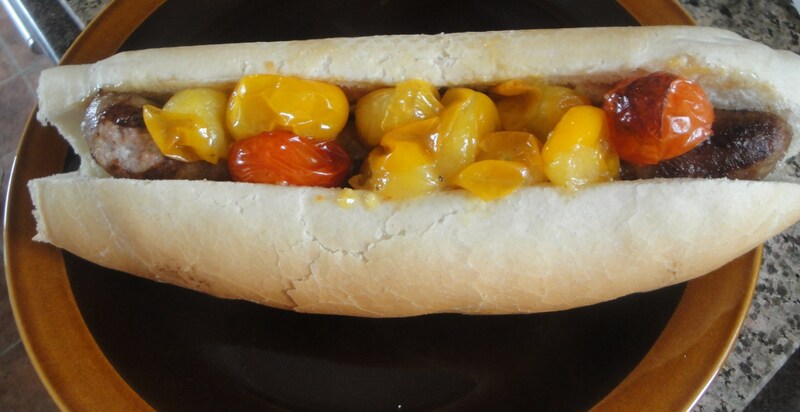 Today however I had some space both in the fridge and in my stomach and I was in the mood for some of those locally made Harvest Pale sausages. 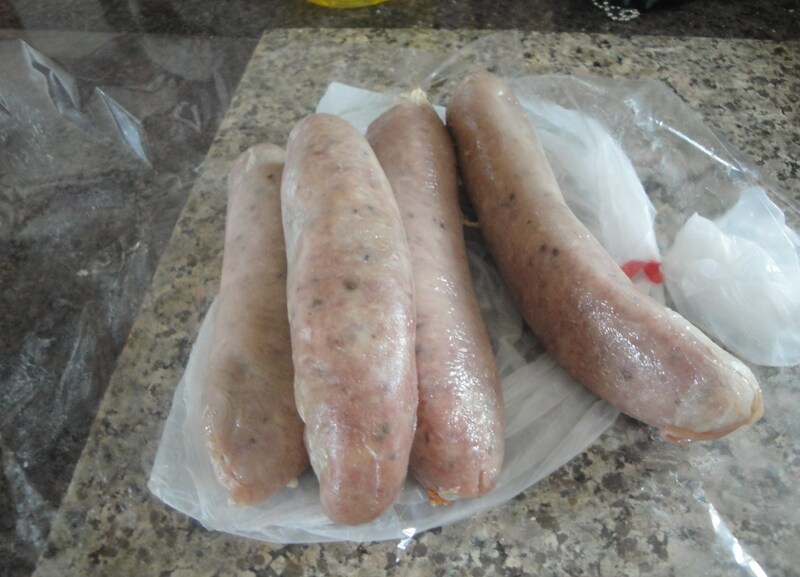 I walked out with four of the Harvest Pale sausages just because that was what I came here for, to be honest they had some Venison sausages on the counter that really I thought looked much more attractive with a deep red colour. 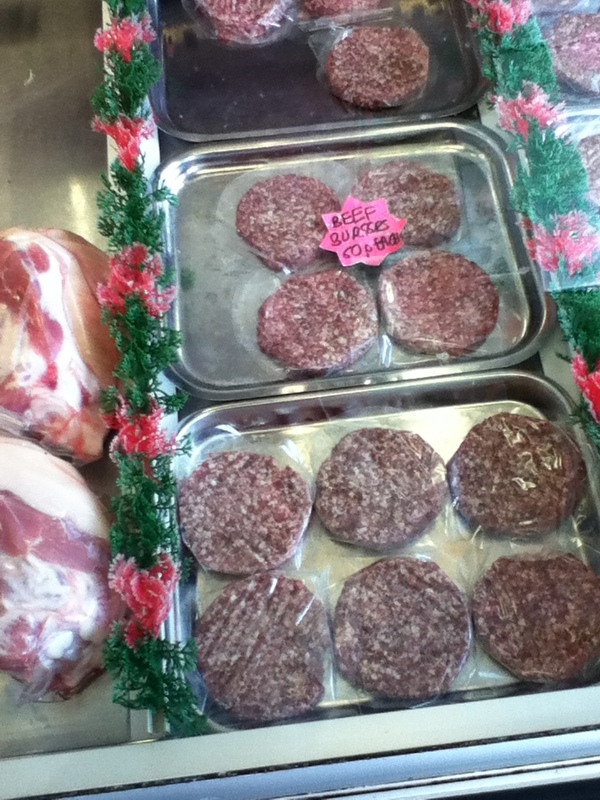 The burgers also looked really good as well, you could see that they were freshly made patties. If we have an Indian summer and the BBQ season gets extended I might have to pop back over to Ruddington to try both out. I decided to cook up my sausage for a lunchtime sandwich by pan cooking them initially and then finishing them off in the oven. That in itself could have made a pretty decent sandwich but just to step it up a little I added some of the tomatoes from the garden into the pan to give a little more sweetness into the sandwich. Visually it looks quite a lot nicer, and it was, to be clear this is just way better than a splash of boring old tomato ketchup. This was a pretty decent lunch (even if I do say so myself). I liked the sausage, it had a deep meaty flavor, not sure if it was reminiscent of harvest pale ale, but it did have that strong taste that you might expect from a malty ale based sausage. Texturally it was a little crumbly but still moist, a really good sausage filling. 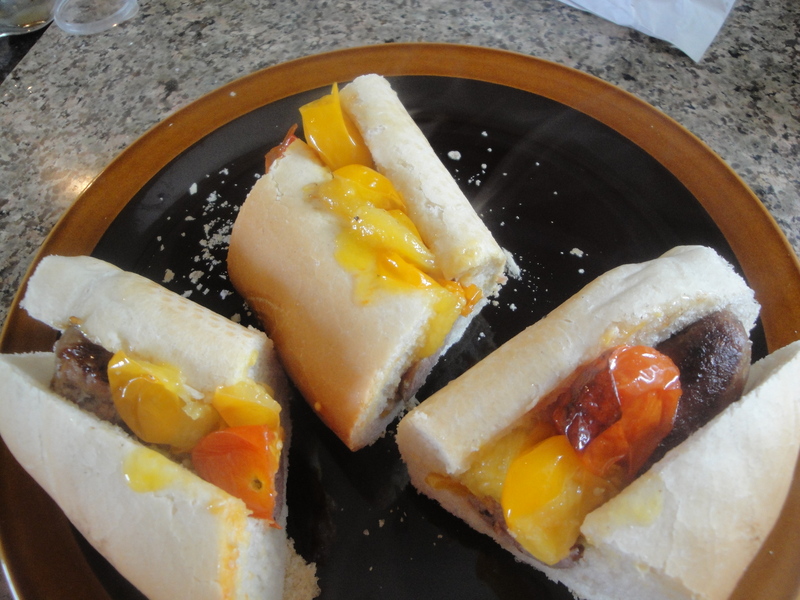 I teamed my sandwich up with a crusty roll from Michaels Fresh Bakes in Clifton, and as I already noted some of our own vine tomatoes from the MyFoodHunt garden. The sausages were quite good value I got four for under £3, two of which went into the sandwich, and the other two stashed away into the bulging freezer for the next BBQ opportunity. There is plenty of parking around the church area in Ruddington if you want to come over and try the butchers offerings and I would say that it would not be a wasted trip they have plenty to offer. If you want to keep up to date with what the guys at Ruddington Village Butchers are up to Follow them on Facebook and Twitter .